Why you should consider a luxury holiday to Tuscany this Autumn. 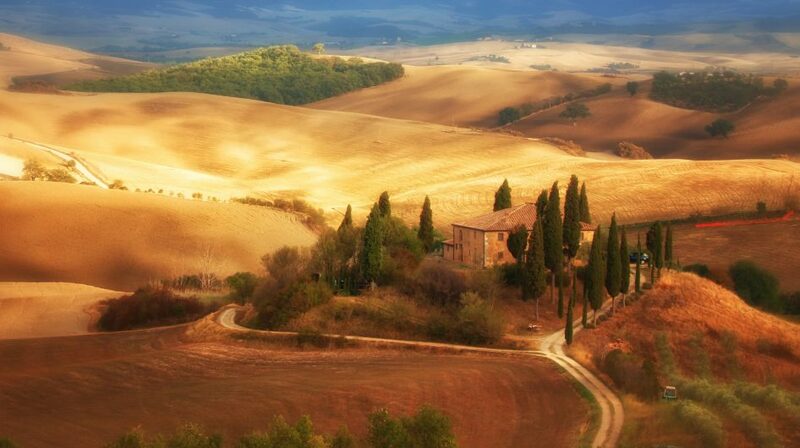 Now that summer is slowly drawing to an end, most of us have let the idea of a summer holiday leave our minds instead imagining a luxury ski holiday, but a luxury holiday to Tuscany this autumn could be the perfect solution for those looking to escape for some last minute sunshine. There is something quite magical about Italy at the end of summer, making it the perfect destination for an autumnal holiday. The change of the seasons brings with it a slightly cooler climate and stunning landscape views of vibrant warm colours. Luxury villas in Tuscany are in high demand all year round, so what is so special about this time of year? Here are my top 5 reasons why we should all be considering a luxury holiday to Tuscany this autumn. With temperatures much warmer than those in the UK at the same time of year, it is the perfect time to get some final sunshine before winter really takes over. Compared to summer in Tuscany, it is certainly less mild but this means you can make the most of your time and fill your days with activities without getting too hot and bothered! Temperatures in the autumn normally vary from 17°C- 24°C so are perfectly comfortable. Be sure to pack some layers for the cooler evenings and double check the forecast before you travel. Along with the slight plunge in temperature, arguably the main thing that will strike you about Tuscany in the autumn is the change in colours as the fiery tones take over. 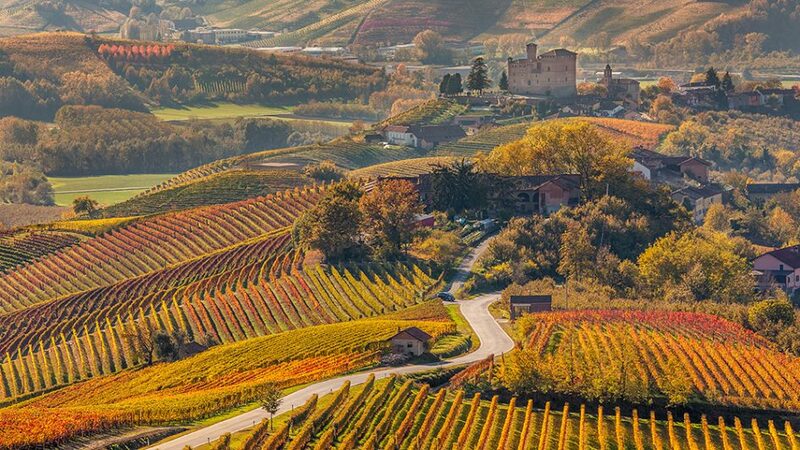 Like the UK, the leaves turn to orange and red but with the rolling hills and stunning open views that Tuscany has to offer, the change to autumnal colours is all the more breathtaking. Perhaps one of the most compelling arguments for ‘off season’ holidays – you don’t have to share your destination with thousands of other holiday makers! If you are looking for an authentic Italian experience, autumn is the time to have it. 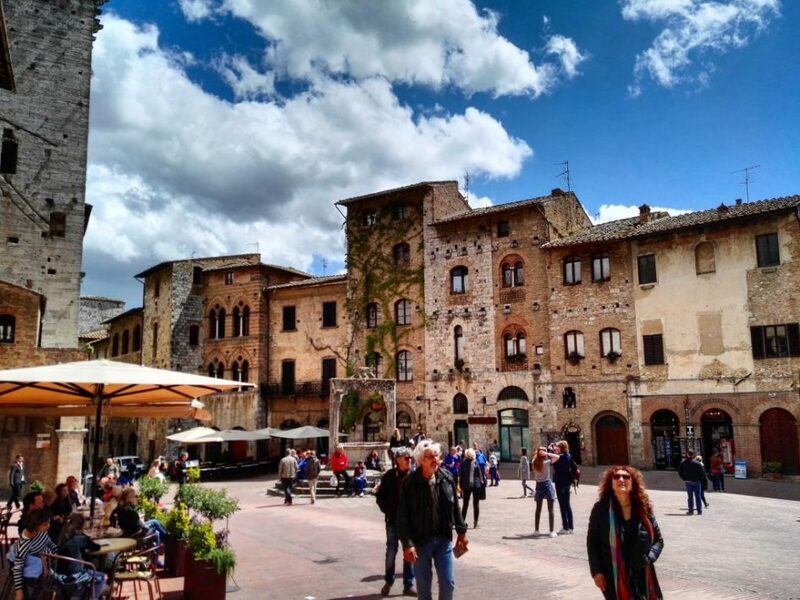 You will be able to wander down the beautiful streets in the many picturesque towns and villages Tuscany has to offer, without having to manoeuvre through the crowds. It can also mean better value for money when looking for a luxury villa in Tuscany. As the season comes to an end, prices drop and you can find a fantastic deal. 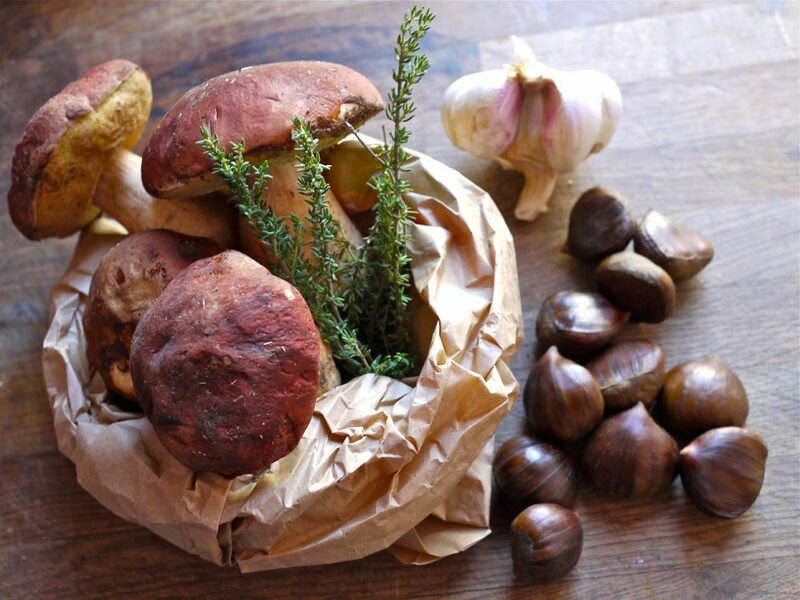 As well as the staple pasta and pizza that many indulge in when in Italy, why not head to Vivo d’Orcia, a small village near Castiglione d’Orcia, for the annual Mushroom and Chestnut festival on the second and third weekend of October. During the festival, the village divides into two for the Palio del Boscaiolo competition, where the teams have to cut logs into tables and stools using antique saws, where they will then eat a polenta dish which was prepared by other members of the team. It is certainly something different you don’t see every day, and will make for a good story when you return from your holiday. There is also a nature walk where the different species of mushroom are explained, but the main attraction is the sale of porcini and chestnuts as well as the local porcini dishes that are available. If you are a foodie, then this is the festival for you this autumn! If your mouth is watering at the sound of this festival, Villa Borgo Finocchieto is located just a 40 minute drive away! Going to all of the well-known tourist spots in the height of summer can make it difficult to fully appreciate them as they’re so busy, so autumn is the best time to check out the local attractions. If the temperatures do fall below expected on one of your days in Tuscany, fear not! 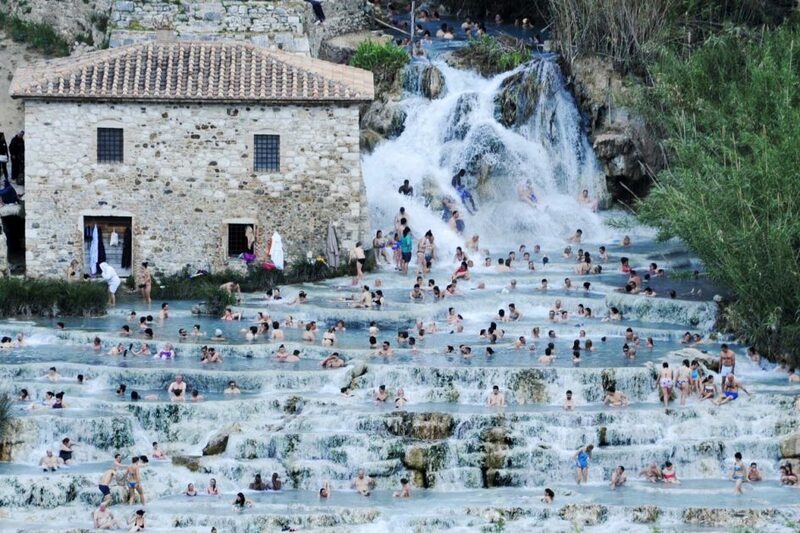 You can take a day trip to the stunning Cascate del Mulino Terme di Saturnia, the most beautiful, natural and free (yes, free!) hot springs in Tuscany. During the summer, tourists and locals alike flock here for some relaxation in the warm waters, but in autumn expect to find a much quieter setting where you can fully enjoy the thermal waters, the calcareous rock pools dug by the waterfall and the beautiful views of the surrounding landscape. The water flows from a natural spring at a temperature of 37.5°C and the springs are open 24 hours a day throughout the year. There is also a free car park and a small cafe/bar on site too so it makes for the perfect day out. The impressive San Luigi Villa is just a 90 minute drive away. Autumn means harvest time in Italy. October and November are the best months to get your hands on freshly picked olives but most importantly, in my opinion, is the wine season! 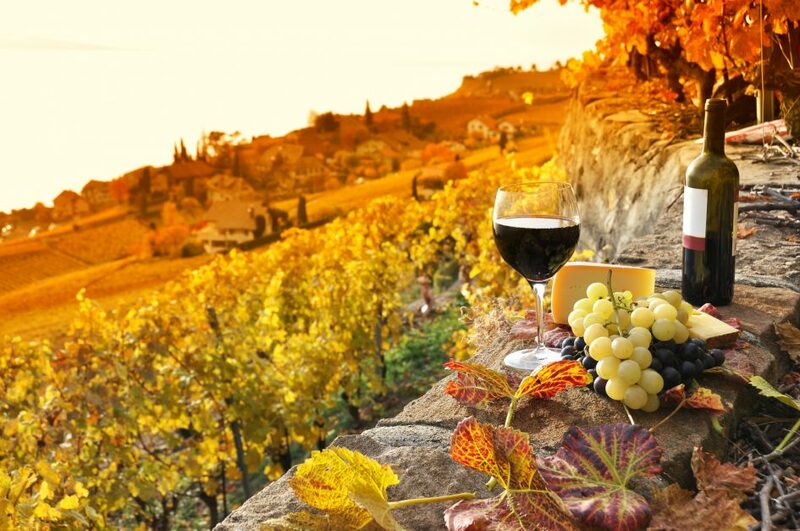 September is the main wine month in Tuscany and several tastings and wine festivals take place. If you are a bit of a ‘wino’ like me, then this is the perfect time to visit. There are many wine tours available during this month, where you can learn all about the wine region and even have a go at making your own! If you are looking for a luxury villa to stay in when you visit, Villa Giuliana is conveniently located in the heart of Chianti Classico surrounded by picturesque vineyards and olive groves. If you need some more inspiration on how to fill the rest of your days on a luxury holiday to Tuscany, here are our top 7 suggestions. If you are in need of some last minute sun, get in touch with our Vila Specialists at Villas In Luxury to start planning your luxury holiday to Tuscany this Autumn! You can call us on +44 1202 203656 or send us an email and we will find you the perfect villa in Tuscany this autumn.